Maple pumpkin butter. It was at the bottom of the email highlighting the weekly specials at my local grocery store. Immediately I knew I needed to have some, like NOW! But then of course my dreams were shattered – so much sugar and high fructose corn syrup. Seriously, why!?! So I did what I do best, came home with a big can of pumpkin puree and got to work. The result – insane deliciousness that I literally keep eating with a spoon, with the fridge doors open, in my pj’s. Normally this would be problem but seriously, it’s maple pumpkin butter, life doesn’t get much better! So pumpkin butter – what’s so special? Well first of all, it’s almost like eating pumpkin pie with a spoon, but on things like oatmeal, pancakes healthy microwave English muffins or Almond Flour Muffins with Sunbutter slathered on them. The best part of the pumpkin pie for me is always the pumpkin part – well that and the whipped cream! I can live without the crust. 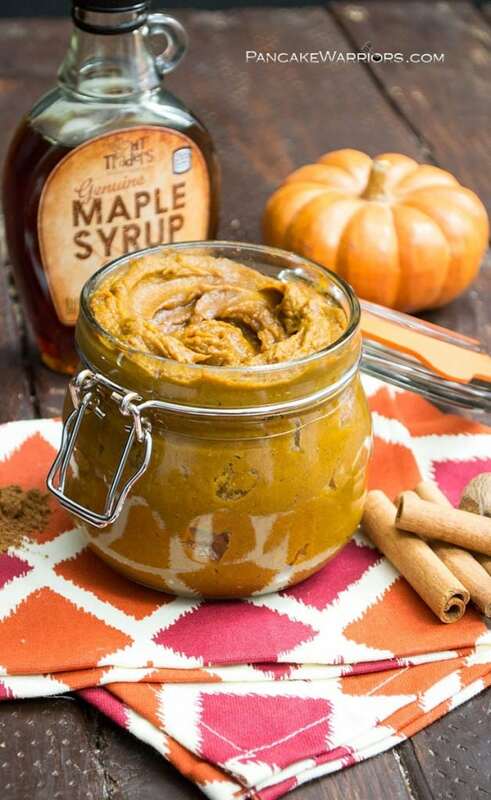 So maple pumpkin butter = all the wonderful things in life. Second it’s full of fall spices – pumpkin pie spice (cinnamon, nutmeg, cloves), cinnamon, ginger and just a touch of cloves. Seriously addictive. And my girl Lindsay pointed out that many of these spices have anti-inflammatory properties. 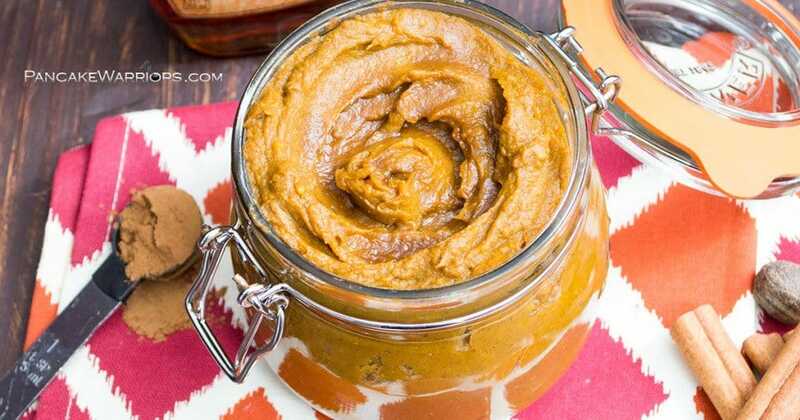 So this maple pumpkin butter helps heal your gut and your sore muscles! WINNER! 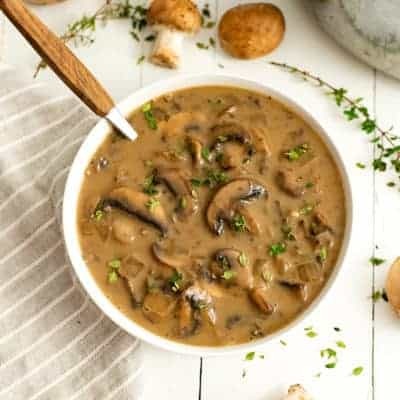 But the real reason this is so special – it only takes about 15 minutes and I bet you already have all the ingredients on hand! Unlike apple butter that has to cook for good hour or two to reduce down and do it’s butter thing, canned pureed pumpkin already has most of the moisture removed. So all it needs is some time on the stove and the addition of all the spices and maple goodness. 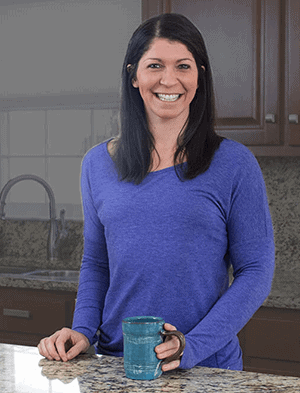 I use a combination of maple syrup and stevia in my recipe. Why? Well because I knew I would probably be eating this late at night in front of the fridge directly with a spoon, and I don’t need that surge of sugar late at night. So 2 tbs. maple syrup and 1-2 packets of stevia. Talk about the perfect amount of sweet. But if you don’t do the stevia thing no worries, just add an additional 1-2 tbs. of maple syrup or coconut sugar. Still amazing! Pumpkin – low in calories, high in Vitamin A, Vitamin C, Vitamin E and boatload of other vitamins and minerals including potassium, copper, manganese, magnesium, iron and niacin, just to name a few. Pumpkin is considered a nutrient dense food. Nutrient dense foods are foods that are high in nutrients when compared to the calories per serving. The goal to achiveing a well nourished life it so add more nutrient dense foods and remove the nutrient poor foods from our everyday diet. So you have my permission, eat all things pumpkin! Don’t even feel bad! Cinnamon – In studies, it’s been found that cinnamon may reduce inflammation. Cinnamon is often recommended to people with IBS as a digestive, since it’s been shown to help reduce the uncomfortable symptoms of IBS, especially bloating. Given Dave’s recent food sensitivities and allergies, I try to incorporate cinnamon in his diet in a way that he will enjoy, to help ease the pain of his symptoms. Enter maple pumpkin butter! Cloves – can help boost the immune system! The dried clove contains compounds that help in improving the immune system by increasing the white blood cell count. Cloves have also been shown to help provide relief from inflammation and pain and has been used for centuries in Chinese medicine. Ginger – I love ginger for it’s anti-inflammatory properties related to muscle soreness. Ginger has been shown to help reduce muscle pain and soreness, the perfect remedy for my clients who are new to weight lifting! Ginger has long been my go to when I’ve had stomach issues like nausea or the flu. Anyone else remember getting Ginger-Ale when they were sick as a kid? Well now I have hot ginger tea anytime I’m not feeling too great! PS ladies, ginger has also been used as a way to relieve the menstrual pain! Nutmeg – has been used in Chinese medicine as a way to treat inflammation and abdominal pain. Nutmeg can be beneficial to reduce inflammation of the joints. It’s also been shown that nutmeg oil helps remove excess gas from the intestines. 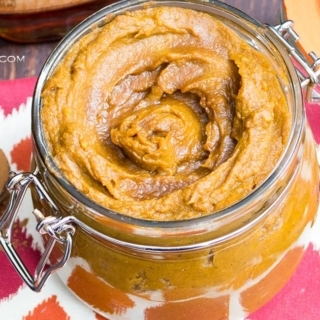 See how easy it is to make this delicious Maple Pumpkin Butter in the video below! Don’t forget to grab preserving jars, I love these (affiliate link), to store your maple pumpkin butter in! 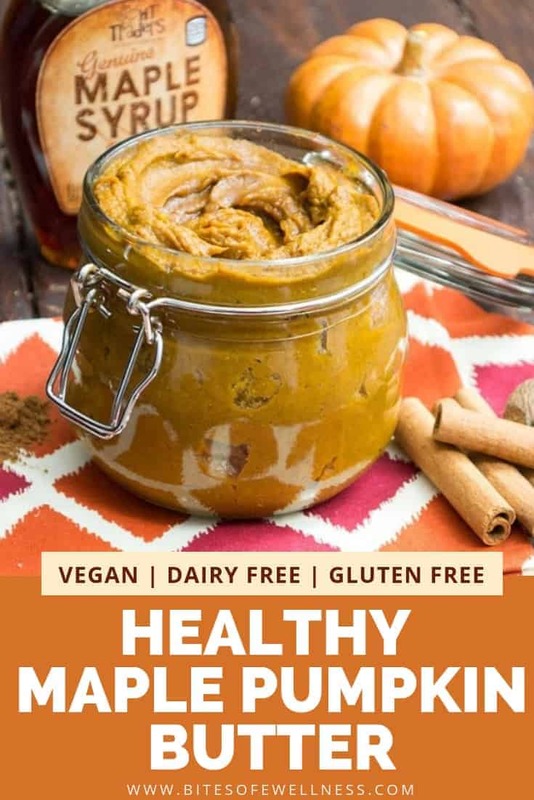 Maple Pumpkin Butter - gluten free, low fat, vegan and packed full of pumpkin flavor! Ready in just 15 minutes, good on toast, pancakes, oatmeal, English muffins, you name it! In a medium sauce pan, combine ingredients and cook over medium low heat for 15 minutes, stirring occasionally. Store in a glass container in the fridge for up to 1 week. Have you ever seen something at the store and recreated it instead of buying it? This looks amazing. I have a question though. How much nutmeg? 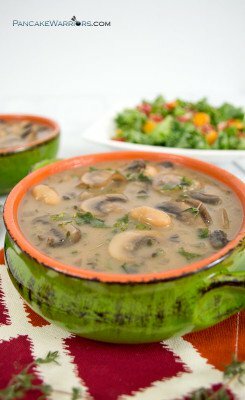 It’s listed on the health benefits but not in the recipe. Hi! 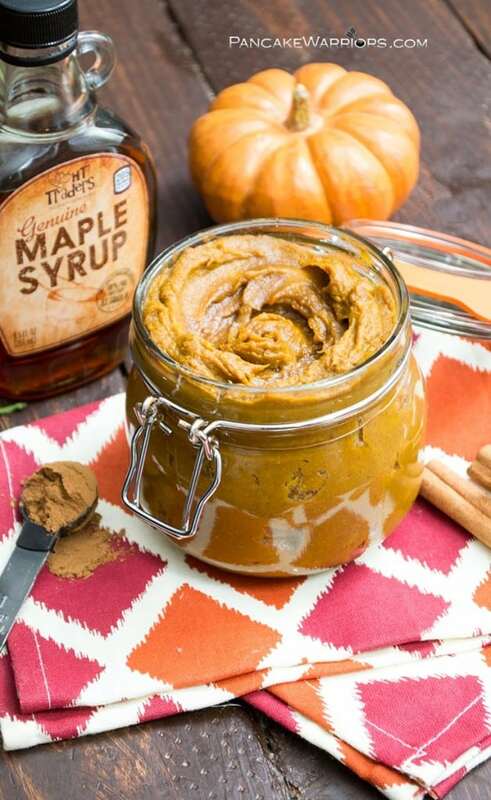 Can I use homemade pumpkin puree?